The majority of countries in the world run on the principles of democracy, which functions on the dictum of the people, for the people, and by the people. The very foundation of democracy lies in the ability of the people to voice their opinion and choose their own leaders among themselves, through the process of voting. Voting, although an optional right in most countries, is the sole medium through which the people of a nation can definitively voice their opinion about their leaders, but why this hullabaloo about being able to choose your own government? Read on to find out why it is important that we vote and elect our own government. First of all, the matter of being able to choose our own government is no mean matter in itself. The government of a country is responsible for running the country efficiently. There is a lot of power vested in the government, and unless the popular vote is in effect, there is no saying how easily a government can turn into a dictatorship, or descend into total anarchy. The process of voting allows you to decide which candidate is the best suited to run the government, and through this process of choosing, you are able to ensure that you have a good government that will take care of you and lead your nation to the betterment. In a democracy, you will have a number of candidates to choose from. It is possible that you will not like the policies of all of them, and that in fact some of them might genuinely be bad for the country. However, if you decide not to vote at all, believing that none of the candidates is any god, then you run the risk of having others vote for a really bad candidate, and you will be stuck with them as the leader of the country for the next few years at least. It is true that we cannot have candidates to our liking all the time, and in times like these, we need to make sure that we choose the lesser of the two evils. If we do not vote, we might end up with the greater of the two evils, and that will not be of any good t anyone. The act of voting keeps the parties in check. When candidates are elected by the general public through popular ballot, it is not possible for them to engage in too many corrupt activities, or renege on all their promises. If they do so, it is likely that they will incur the displeasure of the general public, and will get voted out of the system in the next election. The system of voting ensures that the spirit of a government is in place, and that we are actually taken care of by the government that we elect. By voting, we voice our approval and disapproval of the policies followed by a candidate, and that makes it possible for us to get a good government. If we do not vote, we do not get any say in the government. It is only through voting that we actually get to speak out about the government and its policies. As responsible citizens of the state who actually take an active part in politics and the government by voting, we earn the right to criticize the government’s moves when we feel it is not in the best interests of the people of the state. If we do not vote, we automatically lose the right to criticize, because we were not the ones who played any part in ushering in a better government. We need to vote simply because the alternative is too dire to think of. Look at countries like Somalia and North Korea. Look at any of the dictatorship regimes in the world. Unless the system of popular voting is there, we run the risk of descending into complete anarchy without a government, because every country needs a leader to put things in place. Again, if we give a leader too much power by abolishing the system of popular voting, we become the parents of a dictator, who knows they can do as they please because the fear of losing in the next election is non-existent. 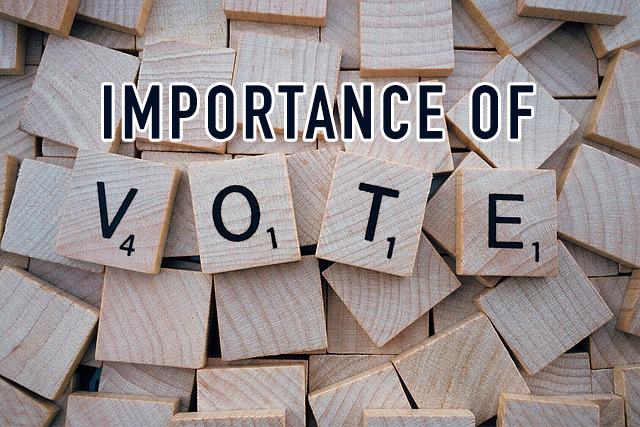 It is important to vote not just because it is a fundamental right, but because it is, in all intent and purpose, a fundamental duty to our state. If we do not vote, we are going against the very spirit of democracy. If we do not vote, we lose all right to say anything when the government goes wrong, or criticize the government’s policies. It is important for us to vote in order to bring about much required changes in the society.